Sour cream of lingonberry jam on your pancake? If it’s Thursday, it must be split pea soup and pancakes with lingonberry jam. At least that’s the custom in Sweden where our food appreciation classes happen to be visiting on their virtual world culinary tour. Concidentally, this was happening at the same time D.C. Public Schools were celebrating Nordic day, with traditional foods being supplied by the embassies of Iceland, Norway, Denmark, Sweden and Finland. The split pea soup I remember from childhood was thick as mud and full of little bits of gelatinous fat from the ham bone that was cooked in it. The soup we made is over-the-top delicious. Still, it’s not especially pretty, except for the bits of carrot (not fat) swimming around in it, and getting the kids to eat it takes a bit of cajoling. But once they find out how good it tastes, they come back for more. And it’s such an inexpensive way to make a family meal, even if you just serve bread on the side instead of the pancakes. Why pancakes with split pea soup? Frankly, I don’t know. I guess you’d have to ask the Swedes. It’s a bit like dessert–especially if your stuff your pancake with jam. The pancakes are bit more like eggy crepes than the thick, floury pancakes we’re used to here. Personally, I like the combination of sour cream and lingonberry jam on mine. The Swedes are especially proud of their berries, which thrive during the long, northerly days in summer. Lingonberries are a bit tart, like cranberries, which makes for an interesting jam. I was surprised to find it at our local Harris Teeter’s. But then my wife brought some home from a shopping trip to Ikea, the Swedish furnishings store, and it was $2 cheaper. It’s rather a long way to drive for jam, though. Make the soup a day ahead so the flavors have a chance to develop. Start by place 1 pound dried yellow peas (we got ours from the bulk section at Whole Foods), 2 onions peeled and finely chopped and 2 carrots peeled and finely chopped in a stock pot and cover with 8 cups water. Add 1 onion studded with two cloves and 2 ham hocks. Bring to a boil, then cover, reduce heat and cook slowly for 3 hours. Remove the onion with cloves and the ham hocks. If there’s any meat on the hocks, you can chop it up and add it to the soup if you like. Season with salt and pepper to taste. About 30 minutes before serving, bring the soup back to a simmer and stir in 1 teaspoon dried thyme leaves and 1 teaspoon ground ginger. The pancakes can also be made ahead and held warm in the oven. This recipe makes about 2 dozen, each about 4 inches across. 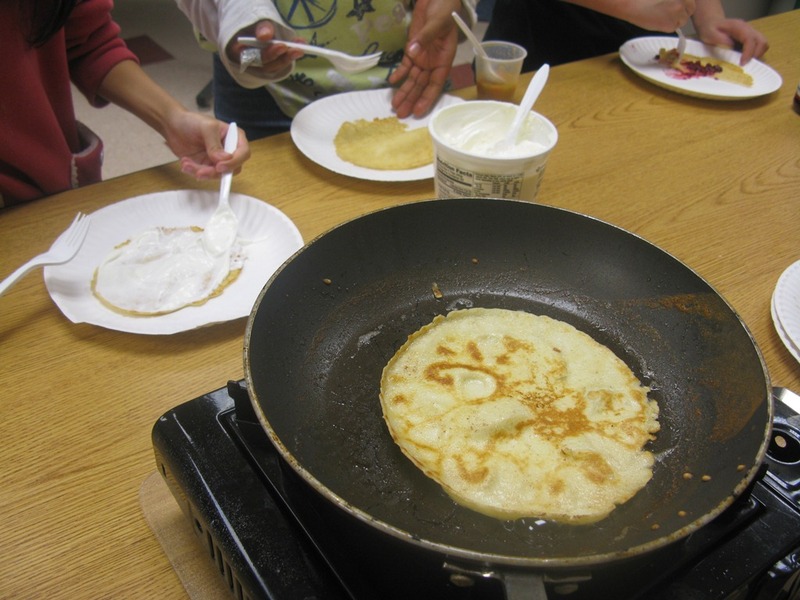 You can make the batter in a blender or a food processor, but we don’t use electric gadgets in our classes. We simply whisked it together by hand. I think the kids get a better feel for the ingredients and the food preparation process working this way. In a large mixing bowl, whisk until frothy three eggs. Mix in 1 1/2 cups milk, then add 1 cup flour, 1 tablespoon granulated sugar and finally 3 tablespoons melted butter. Continue whisking vigorously until the batter is perfectly smooth, without and lumps. Over moderate heat, melt some butter in a small, well-cured or non-stick skillet. Pour in some pancake batter. You can make the pancakes as small or as large as you like. When the underside has lightly browned and the top is nearly dry, use an inverted spatula to flip the pancake onto the other side. Cook for about 30 seconds and remove. Repeat this process until all of the batter has been used. Serve with sour cream and lingonberry jam. Thanks for this inspiring post. Swedes really do love their berries and so do I! More about Swedish slow food: http://www.explorewestsweden.com/?p=1478#more-1478.